I had this little appetizer at Sabor in Edmonton. A few days earlier I enjoyed a terrific meal there but this particular item was not nearly as good and I feature it here because it illustrates the pairing of two foodstuffs that have become ‘fads’ in recent years. Pork Belly, until 5 or, perhaps, 10 years ago, was a very under-appreciated and underused cut but which has since blossomed as a ‘foodie favorite’ such that any restaurant that aspires to fine dining is essentially required to include it in at least one dish. This is not necessarily a bad thing but it should mean that the cut should be prepared in such a way as to let its special qualities shine. Thirty years ago, I used to see Balsamic Vinegar mentioned in the odd Italian cookbook, but it was years before I ever saw a bottle in a store here in Canada. True Balsamic Vinegar is originally a specialty of Modena in Italy, and the properly aged article can sell for hundreds of dollars for just a few ounces. Nowadays, however, you see it everywhere and the truth is that most of the stuff available in stores, or used by restaurants, could easily be substituted with a plain Apple Cider vinegar colored with a little caramel. As in the little appetizer featured here, you can stick the name Balsamic into a name and it lends a cachet to a dish that is out of proportion to the actual quality. 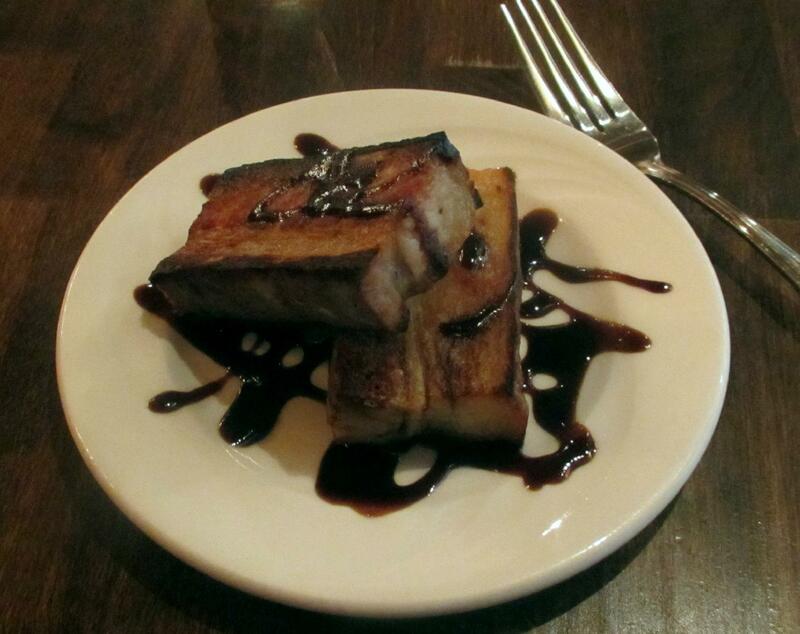 The menu at Sabor described this dish is being ‘Braised Pork Belly in a Quince-Balsamic reduction. I cannot attest to the use of quince here as I couldn’t detect much on the way of fruity sweetness, but it was pretty clear that the drizzled dressing did contain one of the products that pass as Balsamic Vinegar. The effect was not bad, I suppose, but really nothing special. As for the pork belly itself… it may have been braised briefly, but it appeared to have been finished quickly on a grill or griddle. The latter process was not long enough to lend it any nice charring or caramelization, and the ultimate result was pretty much the same as plain pan-frying, without the unctiously tender qualities you get when the cut is well prepared. The entire production, in short, was really just a glaring example of exploiting the cachet of certain foodstuffs and failing to deliver anything special at all. I thought the same thing–doesn’t look to appetising. Pork belly needs to be done right to taste great. As for balsamic, for years I couldn’t understand the fuss over it. Then I had a taste of the real thing. A friend had brought a tiny bottle of it back from Italy. Like tasting a perfectly aged wine from an outstanding year. I have never since repeated the experience. I keep meaning to splurge and buy one of the expensive balsamics available online. Haven’t done it yet but it will make an interesting post.